My father's parents, Ingrid and Bengt, grew up in Sweden, though they met each other in the United States. When they started a family, they tried very hard to assimilate. They didn't teach their kids Swedish and they did the Boston Globe's crossword puzzle every week to improve their English vocabulary. They named their first three children James, John and Joan, which forced them to practice the English "J" sound, one that the Swedish do not use. They were proud of their Swedish heritage, but were determined to become Americans. Simple as that. However, Christmas was a different matter. My grandparents didn't have a turkey dinner or a Christmas ham. No, Christmas meant a Swedish Christmas buffet. My late father continued his parents' tradition with added vigor, using it as an excuse to cook all of the Swedish food he knew how to make. He would spend days in the kitchen, carefully laying out labeled serving dishes on multiple tables, ready to fill with the abundance of dishes we prepared using recipes gathered from at least half a dozen cookbooks. 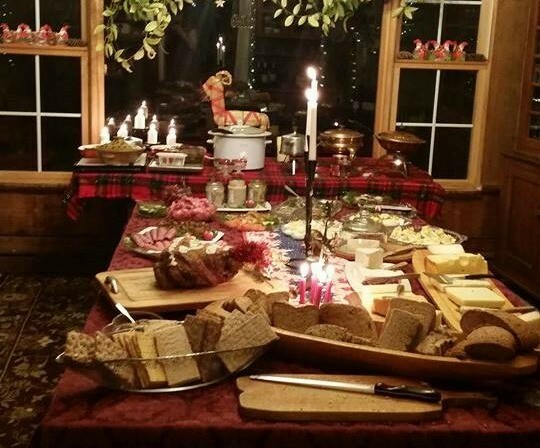 Visiting Swedish relatives have told us that we overdo the julbord, the Swedish word for the Christmas table. Of course we do. We are American, after all. 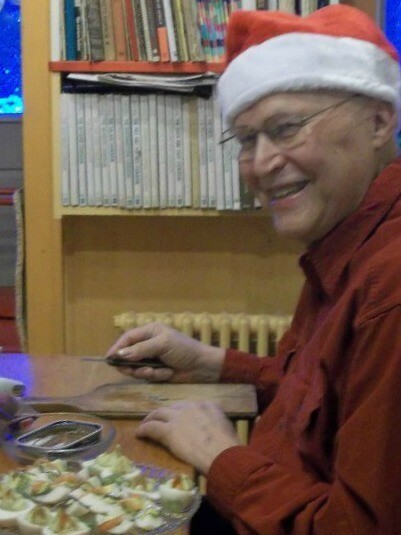 I still vividly remember my dad's last Christmas. He was so happy to show all of us how to make the dishes he customarily made by himself. My sister was taught how to make Swedish cabbage rolls. Mom learned his secret to the Christmas liver pate. My husband and I got lessons on Swedish Christmas sausage. My other sister got the finer points of Swedish deviled eggs. One dish that we didn't need instructions for was Swedish meatballs. The recipe is one my grandmother and grandfather perfected through the years. In America, "swedish meatballs" seem to be synonymous with any small meatball in cream sauce spiked with nutmeg. But this is not the way our family enjoys them. My grandparents' recipe was clear: The only spices you need are salt and white pepper. Our Swedish meatballs are made of equal parts beef and pork, ideally ground together by the butcher. Since your friendly neighborhood butcher can be hard to come by these days, we settle for buying ground meat and then running it either through a meat grinder or pulsing it in a food processor. The key is getting a finer grind of meat than what you typically find in pre-packaged ground meat. The real fun, though, comes in the rolling. Many hands do indeed make light work, and your winter-chapped hands will thank you for the moisturizing they get from the fat in the meat. You'll want to make these meatballs small, only about a tablespoon each. And, instead of the traditional browning in a pan, my grandparents always broiled the meatballs carefully, until browned on all sides, before transferring to a pot full of pan drippings and water, where they would simmer away until fully cooked. If you must serve these with a cream sauce, be my guest. I prefer them with a dollop of lingonberry jam (a relative of cranberry sauce), which you can find at IKEA, or the better-stocked international aisles of some grocery stores. This recipe makes about 100 meatballs, enough for a crowd. You can also freeze them after they're cooked to enjoy anytime. My family spent a day last weekend with my mother, making Swedish meatballs and other dishes for our annual Swedish Christmas feast. We worked side by side and, somehow, 100 meatballs didn't seem that daunting at all. 1. If possible, have a butcher grind the beef and pork together two or three times through a meat grinder, or do so yourself if you have a grinder. If you do not have a grinder, pulse the meat in a food processor until it is more finely ground than normal. If you can't do this, your meatballs will still be all right, but the texture will not be quite as tender. 2. Soak the breadcrumbs in the milk briefly. You do not want dry breadcrumbs. 3. Melt the butter in a pan and fry the onions over medium heat until they are just translucent (not browned), about 3-4 minutes. 4. Combine the meat, eggs, onion, salt, and white pepper with the soaked breadcrumbs. Mix with a spatula or wooden spoon until completely smooth, finishing the process by hand if necessary (and it probably will be). 5. 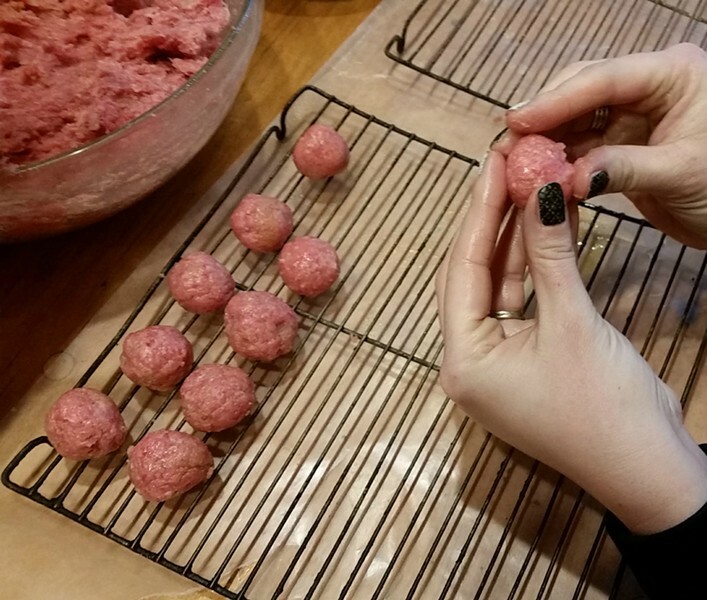 Use your hands to roll the mixture into balls about 1" in diameter, using about a tablespoon of mixture per meatball. Place meatballs on the rack of a broiling pan and, in batches, brown carefully on all sides under the broiler, using tongs to turn them. 6. 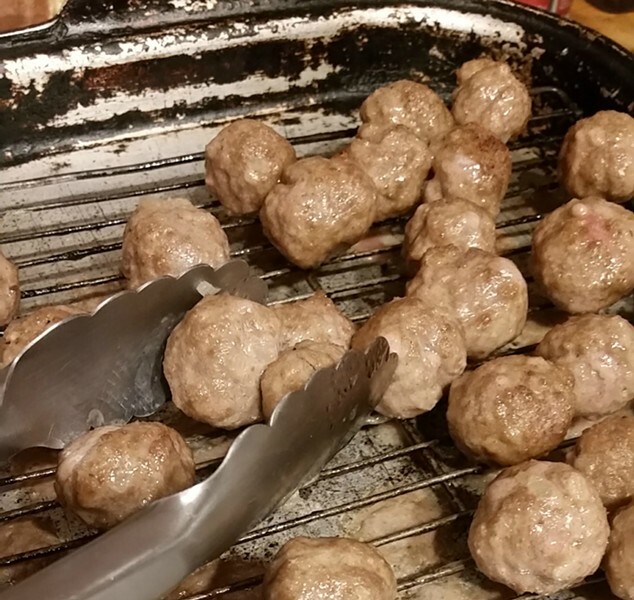 When done, remove meatballs from the rack and place in a large Dutch oven. Clean the broiling pan after each batch by swishing a little water in it and scraping out any pan drippings. Pour the pan drippings and water into the pot with the meatballs for simmering. 7. After all of the meatballs are browned, add a little more water, if needed, to cover the meatballs in the Dutch oven and simmer very gently for about an hour. Serve plain, with lingonberry jam, or with cream sauce made with the pan drippings if you prefer.